Historical map American Expeditionary Force 1918, by Ezra C. Stiles, cartographer, and Paul C. Bowman, historian, published 1932 by Herbick & Held Printing Co., Pittsburgh PA.
© Library of Congress , reblogged from "Maps of WWI"
This business of becoming a computer scientist presents formidable challenges and claims upon one's time! My focus is almost constantly on coaxing words and wires, zeroes and ones, into the proper channels these days. Shepherding one's mind through such wholly new fields is a major endeavor. As a budding programmer, I've come to enjoy the performative nature of coding. The power to make something an instantaneous reality is quite thrilling for someone who, up until recently, had only been the other kind of writer, who carefully tends and marries words and phrases, planting the seeds of what one hopes is, fruitfully, effective prose. And now here I am but...as I've been asking myself lately...where is the (Great) War? A question with what would seem an obvious answer, perhaps. It's back "there," in history, in 1914, '15, '16, '17, '18. But it's before that too, brewing over a course of years and/or decades, and it's most certainly after as well. And I'm not only interested in where the war is, in a chronological sense. Where is it, intellectually? Emotionally? Where does its memory exist? What form or forms does it take today? Where are we, in relation to it? These are the same questions that prompted me to begin this blog, to "find" the war, in photographs, in trinkets, in medals and ribbons, in uniforms and poetry, in songs, in novels and memoirs. They have also driven my other WWI research projects over the last ten years. And I find that these queries still occupy my mind, though now perhaps with a different spin, given my recent technological excursions. In summary, the focus of this blog is still to locate the war, but, perhaps now more programmatically, I want to think about mapping this historical event that, though now past us in a pragmatic temporal sense, now in that great expanse of "nowhere" known as the past (because it is not present), lingers on. Though I may not be the first to say it, the past is ghostly--it haunts the present in the form of objects, memories, texts that we may find in museums, archives, libraries, attics, and in the far reaches of our own or others' minds. It is there. My slightly revamped focus, thus, is to visualize, to materialize the war, for you and for myself, and to generate maps of this event--whether geographical, political, or other--as it exists today. To that end, I will be coming up with some broad categories of war maps to be used here. 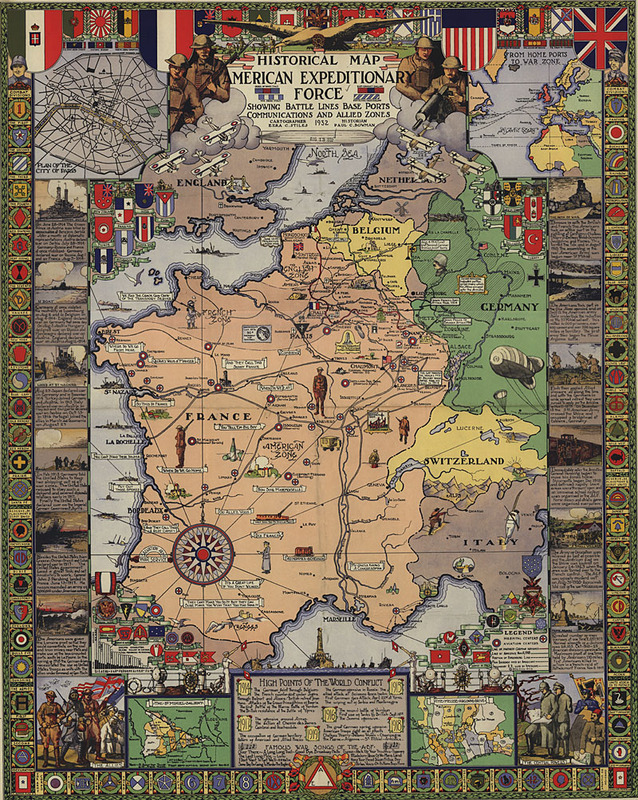 And as for the term map, we can think of it as a form of data visualization, with specific points (in the form of objects, individual accounts of the war, photographs, etc.) plotted in some sort of space that reflects back to us a bigger picture of where this particular set of years and these particular events with which we are concerned here at "Ghosts of 1914", have gone. If this all sounds like so much academic whimsy to you, your instincts may not be so wrong. Let me assure you, though, that the blog will continue in generally the same format as it has. But I'm going to be focusing additionally on developing a bigger picture, or pictures, and on offering those maps back to you, based on the points that I have plotted. This side of things is somewhat experimental, but it will be a data visualization endeavor undertaken before your eyes, with a goal of weaving into a 21st century web a vast assortment of otherwise (potentially) disconnected objects, people, and memories. It is an effort against "lostness," which, some might argue, is the very point of a blog to begin with! Anyway, here we are! More to follow.